Abiquiu, New Mexico, 2013. 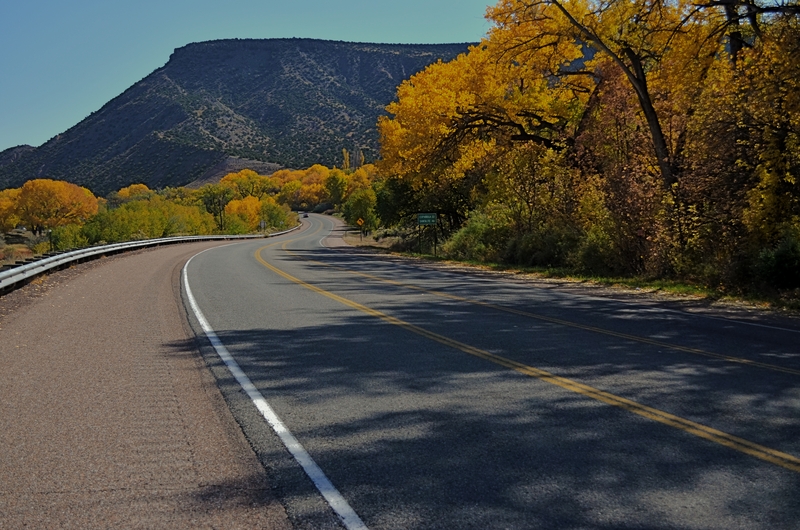 The southwest U.S. does autumn on the soft pedal. AUTUMN IS SNEAKY IN THE SOUTHWEST. Much of the low desert regions may never betray the transformation that is rotating the color wheel in most of the rest of the world, and then, suddenly, there is the shock of red, the blaze of orange, the yellow of golden apples. 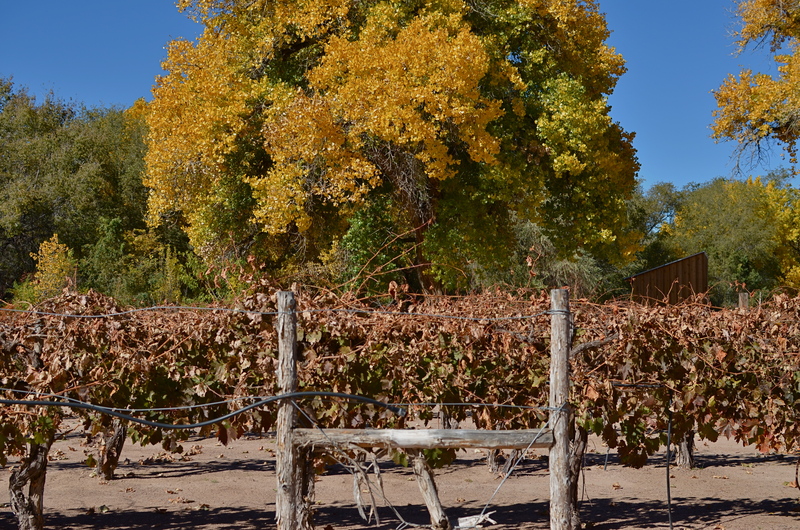 Many of our trees do not shed, and there are parts of Arizona, California and New Mexico where you could snap a landscape and challenge anyone to guess in which month it was taken. But, as I say, there are surprises. There are fruits that fall and go back to the earth. There are strange and alien breeds of gourd popping up as invaders at farmers’ markets. And with these visitations come remembrance, and the chance for the camera to recall all the unrealized dreams, misty dawns, evening cold snaps and afternoons of quiet contemplation that accompanies fall so hypnotically in the rest of the country. We here in the southwest have our autumn reverie doled out in small spoonfuls, but it penetrates just the same. The shadows grow longer. The memory uncorks its vintages. The world turns, and there is that slow rhythm of life winding down. I only long for my midwestern roots but briefly each year. I can still feel the earth turning when some inner clock tells me it’s time. Sometimes I can’t look out my window and find evidence of what my atoms know to be true. And sometimes I get a moment to steal. That’s what cameras are for. To remind us how to be, at least in glimpses, autumn people. A post-processed “color compromise” of the image below. 1/320 sec., f/5.6, ISO 100, 35mm. TAKE ENOUGH PHOTOGRAPHS AND YOU WILL DEVELOP YOUR OWN SENSE OF “SIMPLICITY”. That is, you will arrive at your own judgement about how basic or complex a composition you need in a given situation. Some photographers are remarkable in their ability to create images that contain a mad amount of visual information. Some busy city scenes or intricate landscapes benefit wonderfully from an explosion of detail. Other shooters render their best stories by reducing elements to a bare minimum. And of course, most of us make pictures somewhere in the vast valley between those approaches. I’m pretty accustomed to thinking of overly-busy pictures as consisting of a specific kind of “clutter”, usually defined as cramming too many objects or people into a composition. But I occasionally find that color can be a cluttering element, and that some very visually dense photos can be rendered less so by simply turning down hues, rather than rooting them out completely. Recently I’ve been taking some of the pictures that seem a little too “overpopulated” with info and taking them through what a two-step process I call a color compromise (patent not applied for). First step involves desaturating the picture completely, while also turning the contrast way down, amping up the exposure and damn near banishing any shadows. 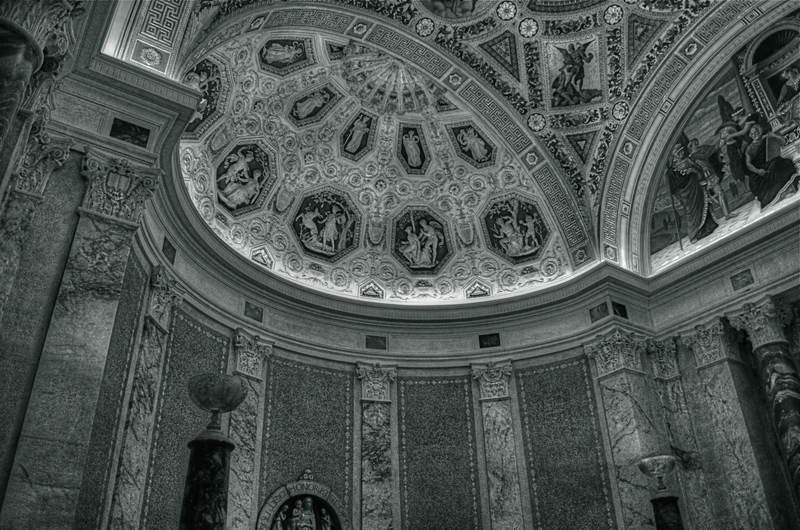 This almost results in a bleached-out pencil drawing effect and emphasizes detail like crazy. Step two involves the slow re-introduction of color until only selected parts of the image render any hues at all, and making sure that the color that is visible barely, barely registers. The final image can actually be a clearer “read” for your eyes than either the garish colored original or a complete b&w. Objects will stand out from each other a little more distinctly, and there will be an enhanced sensation of depth. It also suggests a time-travel feel, as if age has baked out the color. A little of this washed-out jeans look goes a long way, however, and this whole exercise is just to see if you can make the picture communicate a little better by allowing it to speak more quietly. 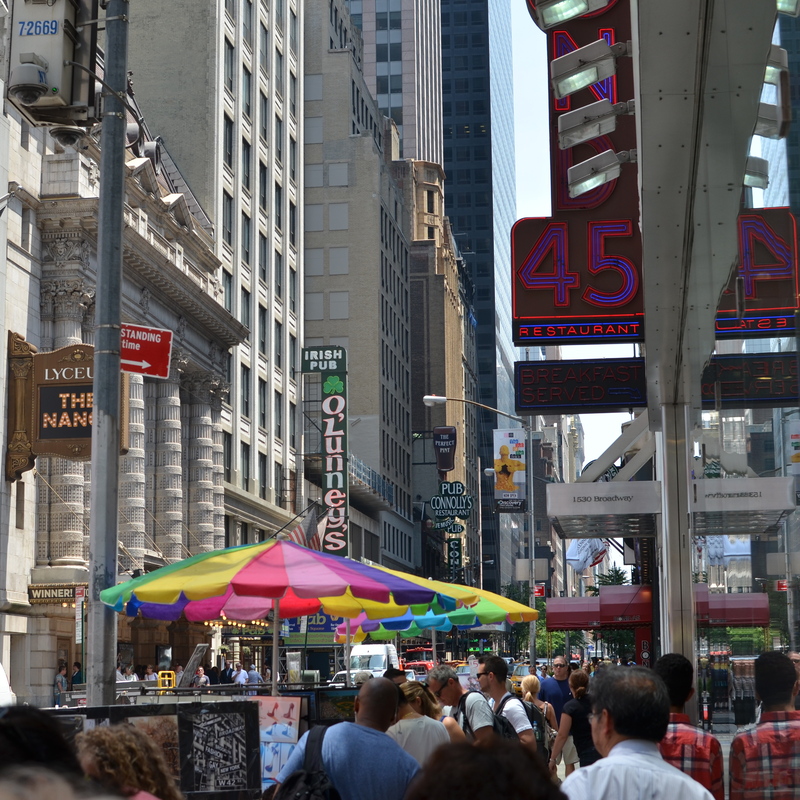 Compare the processed photo at the top, taken in the heart of the visually noisy Broadway district, with its fairly busy color original and see if any of this works for you. I completely stipulate that I may just be bending over backwards to try to salvage a negligible photo. But I do think that color should be a part of the discussion when we fault an image for being cluttered. Surety And Security, 2014. Image made using Nikon’s in-camera “selective color” effect, programmed to highlight blue and gold hues only. 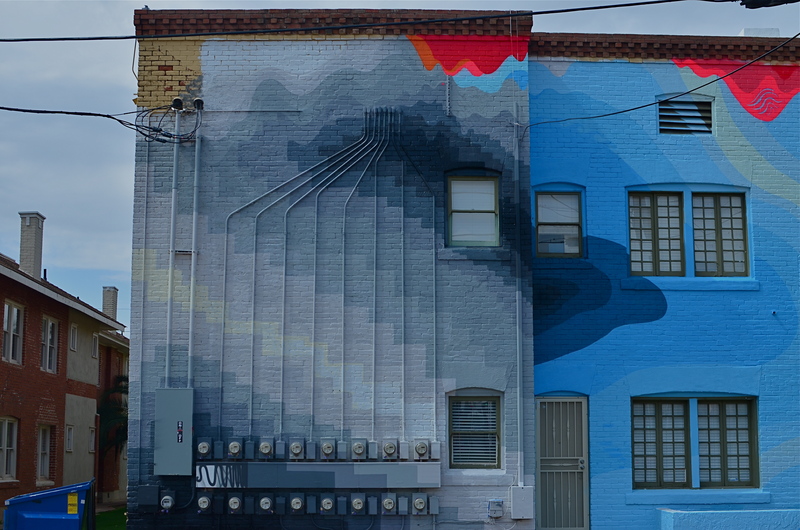 Note the bluish undertones that show up in the “white” building. I FIND IT AMUSING THAT THERE IS SO MUCH PRISSY FRETTING, in the present photographic age, about the manipulation of images, as if there is, or has ever been, a “pure” photography that comes full-born from the camera like Athena sprang from Zeus’ forehead. This is, of course, nonsense. There never was a time when photographers simply pressed the button and settled for whatever dropped into their laps by chance. The history of the medium is a clearly traceable timeline of the very interpretive technique and, yes, manipulation that tracks, like this blog, the journey from taking a picture to making one. It’s not what you apply to an image, it’s whether the application is the entire point of the picture. Does your conception have solid, original value, over which you then impose a supplementary effect or a boost in emphasis? Or are you merely popping apps and pushing buttons in order to disguise the lack of essence in picture, to whitewash a rotten fence if you will? The reason I raise all this again is that an in-camera effect usually called “selective color”, now available on many DSLRs, has reminded me of the first days of color photography, which of course was no color at all, except that which was applied through tinting and painting after a monochrome image had been made. Depending on the individual artisan, the hues in these pictures tended to be either a soft wash of faint pastel or a raging rouge of rosy reds, but, most frequently, only selected parts of the image were colored at all, perhaps an attempt to dramatize particular elements of the composition. It was anything but natural, but, in advance of the development of actual color film, it produced some interesting results. Jump to today’s cameras and the selective color option. You shoot your original image, select it, then zoom in on parts of it to both locate and choose up to three colors that will be featured in a copy of the image. All other tones will be desaturated, leaving you with a part monochrome, part color version of your original, which remains unchanged in a separate file. The effect, as in the past, can dramatize and isolate key parts of your picture, even giving a strange dimensional feel to the photo, but it can take some practice to get the result that you want. For example, selecting the red of a single car on a crowded street will also catch the same red in other cars’ tail lights, the corner traffic signal, and a neon sign in a building at the end of the block, so be sure you can live with all of that. 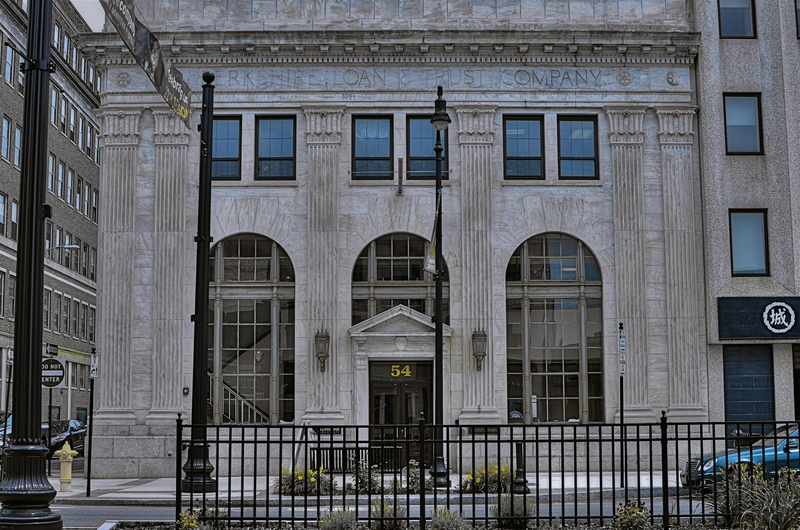 Also, in some seemingly “white” buildings, shadows or reflected light (as well as aging impurities in some materials) will show some faint shades of color in this process, so that the blue that you said okay to for the corner mailbox will also pick up slight bluish casts in the marble of the bank next door. 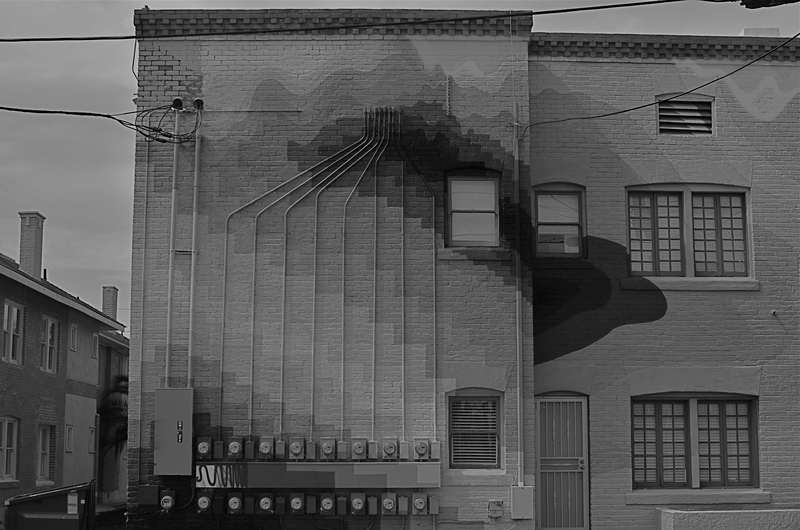 In the above image, I also made a second, darker copy of the altered image, then blended the two copies in a tone compressing program, to further accentuate the building textures and contrasts. Bottom line: there is black and white, there is full color, and there is the uber-cool playland in what you could call the middlehues. It’s not cheating to enhance a good picture. It’s only cheating when you use effects to mask the fact that you didn’t take the picture right in the first place. I really preferred this as the color shot it originally was. Until I didn’t. Changing my mind took seconds. ONE OF THE MOST AMAZING BY-PRODUCTS OF DIGITAL PHOTOGRAPHY, a trend still evolving across both amateur and professional ranks, is a kind of tidal return to black-and-white imaging. The sheer volume of processing choices, both in-and-out-of-camera, have made at least dabbling in monochrome all but inevitable for nearly everyone, reversing a global trend toward near exclusive use of color that was decades in the making. At one point, to be sure, we chose black and white out of necessity. Then we embraced color and relegated B&W to the dustbin of history. Now, we elect to use it again, and increasing numbers, simply because everything technical is within our reach, cheaply and easily. Although publishers and advertisers enhanced their messages with pictures in color during the first few decades of the color era, most influential critics and museum curators persisted in regarding color photographs as “calendar art”. Color, they felt, was, at best, merely decorative, suitable, perhaps, for exotic or picturesque subjects, but a gaudy distraction in any work with “serious” artistic goals. Of course, for years, color printing and processing was also unwieldy and expensive, scaring away even those few artists who wanted to take it on. Still, can you imagine, today, anyone holding the belief that any kind of processing was a “gaudy distraction” rather than just one more way to envision an image? 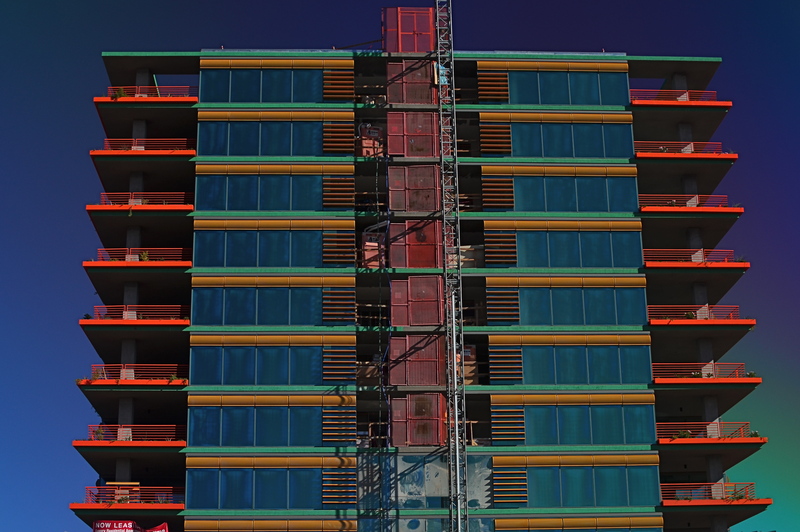 Color was once seen by serious photographers as an element of the commercial world, therefore somehow..suspect. Fashion and celebrity photography had not yet been seen as legitimate members of the photo family, and their explosive use of color was almost thought of as a carnival effect. Cheap and vulgar. Of course, once color became truly ubiquitous, sales of monochromatic film plummeted, and, for a time, black-and-white found itself on the bottom bunk, minimized as somehow less than color. In other words, we took the same blinkered blindness and just turned it on its head. Dumb times two. Jump to today, where you can shoot, process and show images in nearly one continuous flow of energy. There are no daunting learning curves, no prohibitive expenses, no chemically charred fingertips to slow us down, or segregate one kind of photography from all others. What an amazing time to be jumping into this vast ocean of possibilities, when images get a second life, upon second thought. I’M VERY ACCUSTOMED TO BEING STOPPED IN MY TRACKS AT A PHOTOGRAPH THAT EVOKES A BYGONE ERA: we’ve all rifled through archives and been astounded by a vintage image that, all by itself, recovers a lost time. It’s a little more unsettling when you experience that sense of time travel in a photo that you just snapped. That’s what I felt several weeks ago inside the main book trove at the Morgan Library in New York. The library itself is a tumble through the time barrier, recalling a period when robber barons spent millions praising themselves for having made millions. A time of extravagant, even vulgar displays of success, the visual chest-thumping of the Self-Made Man. The private castles of Morgan, Carnegie, Hearst and other larger-than-life industrialists and bankers now stand as frozen evidence of their energy, ingenuity, and avarice. Most of them have passed into public hands. Many are intact mementos of their creators, available for view by anyone, anywhere. So being able to photograph them is not, in itself, remarkable. A little light reading for your friendly neighborhood billionaire. 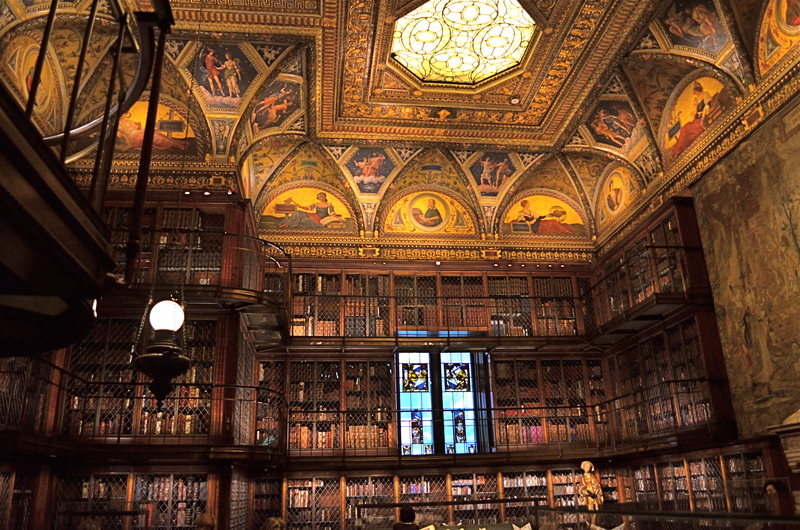 Inside the Morgan Library in NYC. No, it’s my appreciation of the fact that, today,unlike any previous era in photography, it’s possible to take an incredibly detailed, low-light subject like this and accurately render it in a hand-held, non-flash image. This, to a person whose life has spanned several generations of failed attempts at these kinds of subjects, many of them due to technical limits of either cameras, film, or me, is simply amazing. A shot that previously would have required a tripod, long exposures, and a ton of technical tinkering in the darkroom is just there, now, ready for nearly anyone to step up and capture it. Believe me, I don’t dispense a lot of “wows” at my age, over anything. But this kind of freedom, this kind of access, qualifies for one. This was taken with my basic 18-55mm kit lens, as wide as possible to at least allow me to shoot at f/3.5. I can actually hand-hold fairly steady at even 1/15 sec., but decided to play it safe at 1/40 and boost the ISO to 1000. The skylight and vertical stained-glass panels near the rear are WINOS (“windows in name only”), but that actually might have helped me avoid a blowout and a tougher overall exposure. So, really, thanks for nothing. No performers, but the colors say circus time. 1/800 sec., f/2.2, ISO 32, 18mm. PHOTOGRAPHERS ARE ADDICTED TO “INVISIBLE” STORYTELLING, to hinting at a context beyond what is actually shown in a given image. Sometimes our eyes arrive at a scene just seconds after something important has happened. Sometimes it’s just moments before. Sometimes we have to use emptiness to suggest how full something just was. And, most importantly, we need to determine if color will be a warm accompaniment to something magical, or an unwanted intruder in a scene where less is more. Wonderfully, this choice has never been easier. Digital photography affords us the luxury of changing our strategy on the color of a shot from frame to frame in a way that film never could. It also allows us to delay the final choice of what works and what doesn’t, to live with an image for a while, and decide, further down the road, whether something needs to be re-ordered or altered, rendered either neutral or vivid. It is a great time to be a photographer. For those picking up a camera today, it must seem absurd that it was ever any other way. For those of us with a few more rings around the trunk, it can seem like a long promised miracle. Color can be either addition or distraction to a shot, and usually you know, in an instant, whether to welcome or banish it for best effect. Two recent walk-bys afforded me the chance to see two extreme examples of this process. 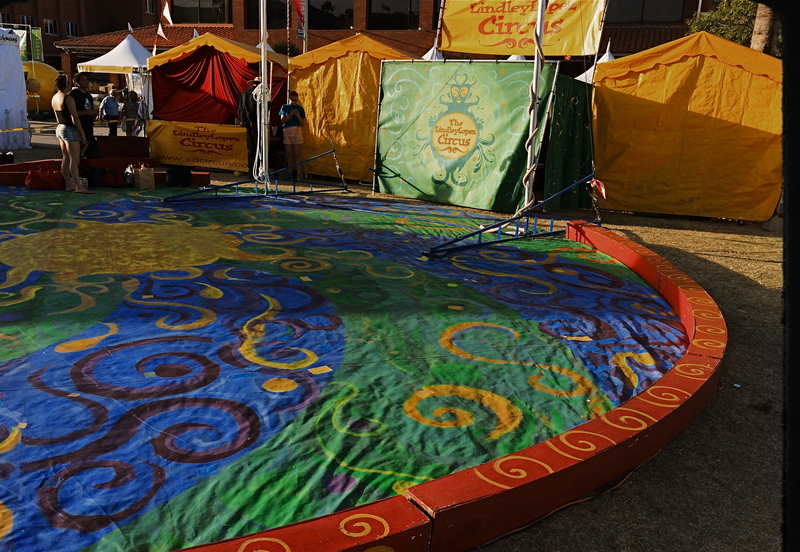 In the first, seen above, I am minutes too early to take in a small street circus, giving me nothing but the garish tones of the tents and staging areas to suggest the marvels that are to come. I need something beyond the props of people to say “circus” in a big way. Color must carry the message, maybe shouting at the top of its lungs. See what I mean? Easy call. The isolation of the woman in the frame argues against the use of garish color. 1/700 sec., f/2.2, ISO 32, 18mm. In the second image, which features a lone woman reading against a backdrop of largely featureless, uniform apartment cubes, I am off on an opposite errand. Here, I seem to be wondering why she is alone, who is waiting (or not waiting) for her, what her being in the picture means. The starkness of her isolation will never be served with anything “pretty” in the scene. The original frame, done in color, actually had the drama drained out of it by hues that were too warm. On a whim, I converted it to the look of an old red-sensitive black and white film. It gave me a sharp detailed edge on materials, enhanced contrast on shadows, and a coldness that I thought matched the feel of the image. In audio terms, I might compare it to preferring a punchy mono mix on a rock record to the open, more “airy” quality of stereo. Dealer’s choice, but I think our photography gains a lot by weighing the color/no color choice a lot more frequently than we did in our film days. The choices are there.The technology could not be easier. Relative to earlier eras, we really do have wings now. We just need to get used to flapping them more often. Terminus, 2014. 1/250 sec., f/5.6, ISO 100, 35mm. Desaturated copy. IT’S TRULY AMAZING TO CONSIDER THAT, AS RECENTLY AS THE LATE 1940’s, many serious photographers were, at best, indifferent to color, and at worst, antagonistic toward its use in their work. And we’re talking Edward Weston, Ansel Adams and many other big-shoulders guys, who regarded color with the same anxiety that movie producer experienced when silent segued to sound. We’re talking substantial blood pressure issues here. Part of the problem was that black and white, since it was not a technical representation of the full range of hues in nature, was already assumed to be an interpretation, not a recording, of life. The terms between the artist and the audience were clear: what you are seeing is not real: it is our artistic comment on real. Color was thought, by contrast, to be “merely” real, that is to say limiting, since an apple must always be red and a blueberry must always be blue. In other words, for certain shooters, the party was over. The color original. A little too Peter Max-y. Look where we are today, making color/not color choices in the moment, without changing films in mid-stream, deciding to convert or de-saturate shots in camera, in post processing, or even further down the road, based on our evolving view of our own work. There are times when I still prefer monochrome as more “trustworthy” to convey a story with a bit more grit or to focus attention on textures instead of hues. In the above shot, I decided that the spare old building and its spidery network of power meters simply had more impact without the pretty colors from its creative makeover. However, one of my color frames was stronger compositionally than the black and white, so I desaturated it after the fact. Fortunately, I had shot with a polarizing filter, so at least the tonal range survived the transition. The miracle of now is that we can make such microscopic tweaks in our original intention right on the spot. And that’s good, since, when it comes to color, nothing is ever black and white (sorry). Fan photo: 1/80 sec., ISO 100, 35mm. THERE ARE TIMES WHEN THE RAW VISUAL FLOOD OF INTENSE COLOR IS THE MOST INTOXICATING DRUG ON THE PLANET, at least for photographers. Sometimes you are so overcome with what’s possible from a loud riot of hues that you just assume you are going to be able to extract a coherent image from it. It happens the most, I find, with large, sprawling events: festivals, open restaurants, street fairs, carnivals, anywhere your eyeballs just go into overload. Of course there must be a great picture in all this, you promise yourself. And there may be. But some days you just can’t find it in the sheer “Where’s Waldo”-ness of the moment. Instead, you often wind up with a grand collection of clutter and no obvious clues as to where your viewer should direct his gaze. The technical term for this is “a mess”. I stepped in a great one the other day. 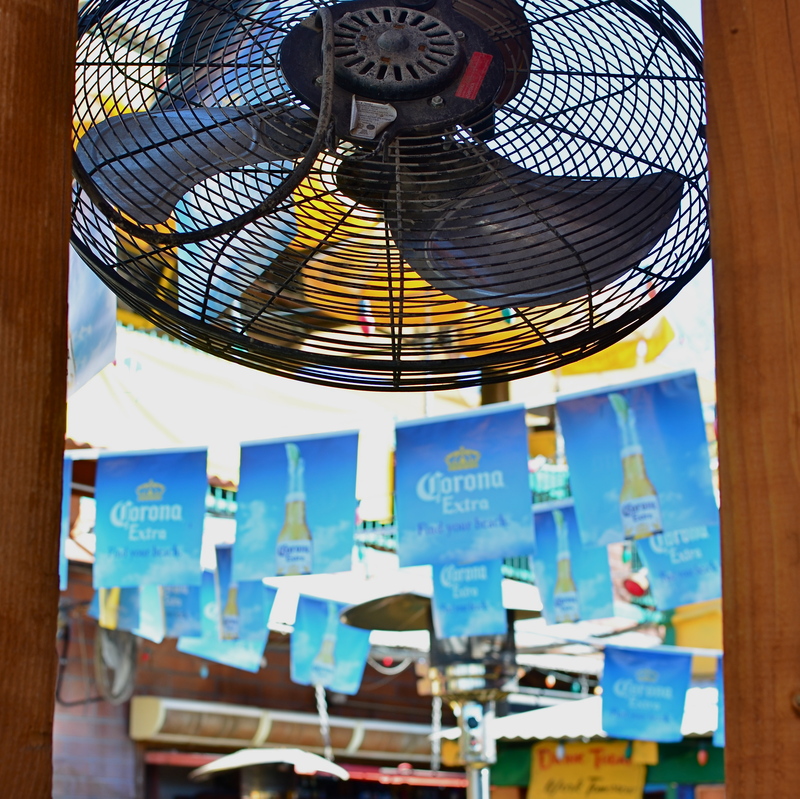 It’s a local college-crowd bar in Scottsdale, Arizona, where 99% of the customers sit outside on makeshift benches, shielded from the desert sun by garish Corona umbrellas, warmed by patio heaters, and flanked by loud pennants, strings of aerial lightbulbs and neon booze ads. The place radiates fun, and, even during the daylight hours before it opens, it just screams party. The pictures should take themselves, right? Well, maybe it would have been better if they had. As in, “leave me out of it”. As in, “someone get me a machete so I can hack away half of this junk and maybe find an image.” Try as I might, I just could not frame a simple shot: there was just too much stuff to give me a clean win in any frame. In desperation, I shot through a window to make a large cooling fan a foreground feature against some bright pennants, and accidentally did what I should have done first. I set the shot so quickly that the autofocus locked on the fan, blurring everything else in the background into abstract color. It worked. The idea of a party place had survived, but in destroying my original plan as to how to shoot it, I had saved it, sorta. I have since gone back to the conventional shots I was trying to make, and they are still a vibrant, colorful mess. There are big opportunities in big, colorful scenes where showing “everything in sight” actually works. When it doesn’t, you gotta be satisfied with the little stories. We’re supposed to be interpreters, so let’s interpret already. Think this picture’s bad now? Hey, wait til I start messing with it. 1/40 sec., f/8, ISO 320, 55mm. I CAN HEAR MY MOTHER NOW: “Don’t pick at it, you’ll get it infected”. Okay, she usually was referring to a scab on a skinned knee. But often, when I can’t stop interfering needlessly with an image, I could swear she’s talking about photographs. You know the ones I mean. The near misses that you would swear could be transformed into masterpieces with just one….more…tweak. Or maybe two. Or thirty. They are often the pictures we love most, like bad kids, simply because they had such potential, at least until we snapped the shutter. Then we stick them, flaws and all, on life support and start playing with things. Contrast. Color. Exotic filters. A spoonful of sugar. A pound and a half of good intentions. The same shot in monochrome. Yeah, less is sometimes just less. And, sometimes, by getting our tweak on in a heavy-handed fashion, we make things worse. We render them garish, or glowing, or gooey, and still not what we intended. It’s like tutoring a kid that will never ever make the honor roll. It seems like we ought to be able to do something. 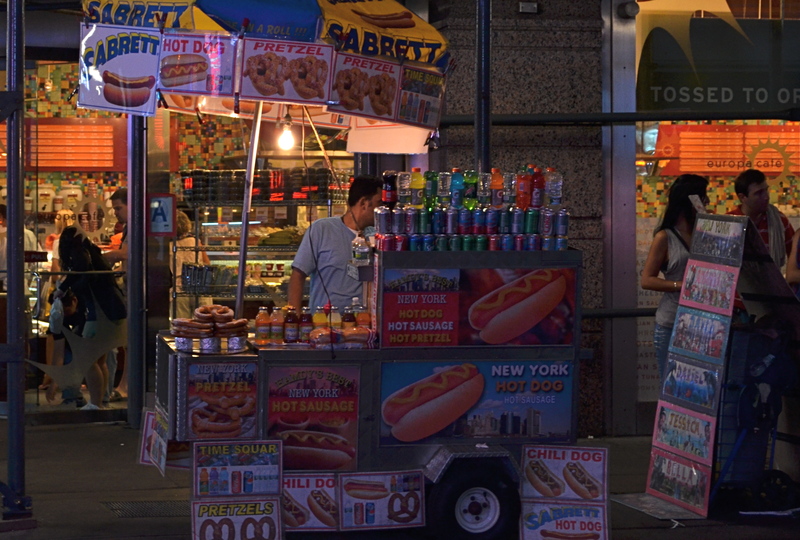 That’s the story of the above color street shot, taken just after sundown in Times Square. All the elements of a good picture are there, but the thing is just all right, nothing more, nothing less. At some point before I first posted it on Flickr, I got the brilliant notion that it would look more “authentic” if desaturated to black and white. Re-examining it more than a year later, I realized “authentic” was code for maybe I can distract people from the fact that I didn’t really bring it home in this shot. Once it was monochromed, the image was actually robbed of whatever minimal punch it might have originally had. All the zippy color of the signage and soda cans was banished, to replaced by….a really dull and narrow range of half-tones. 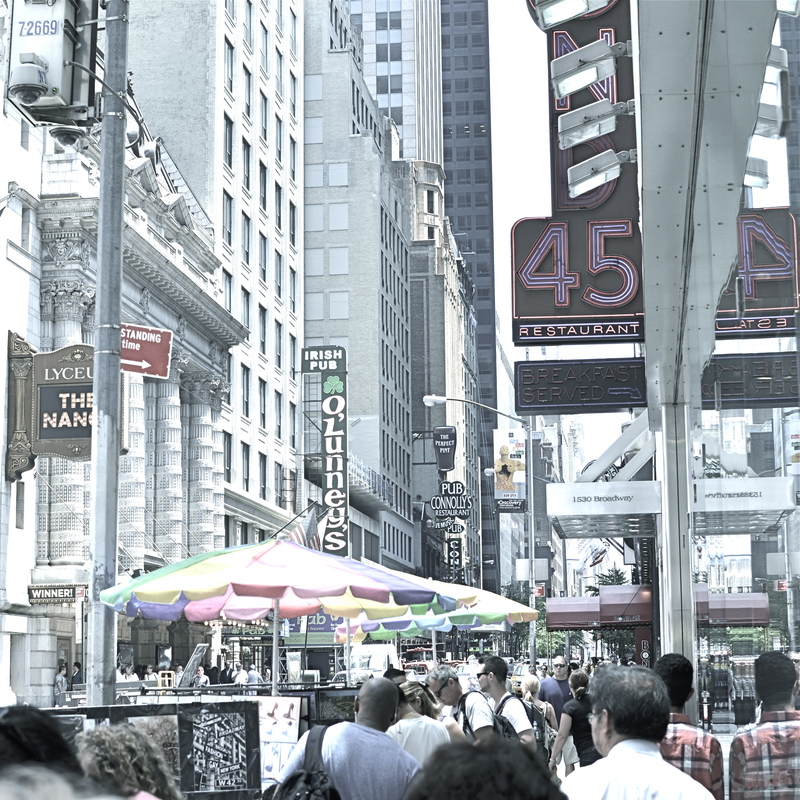 All the depth and presence went out the same exit door as the color, but I went ahead and posted it anyway, trying to convince myself that I had made it much more “street”, when all I had really done was strip out the carnival hues that really said “Broadway”. I had worked against myself, and, worse, I had wasted time on a shot which should have gone in the reject pile from day one. It’s not a miserable photo, and maybe that’s what really hard to accept. It might have been something. What I should have done, while I was there, was keep trying about ten more frames of this guy and maybe saving the concept. You know, try to get the photo right in the first place. Yeah, I know, how quaint. Thing is, once it was a mediocre picture inside the camera, all I could do was pick the scab. And then it got infected. EVERY MAJOR CITY AROUND THE WORLD THAT BOASTS BOTANIC GARDENS OR PLANT CONSERVATORIES HAS EXPERIENCED THE STRANGE MIXTURE of biology, art, and science created by the glass installations of Dale Chihuly. Beginning as a starving student in Venice in the late ’60’s, Chihuly has carved out a unique niche for himself as the premier maestro of art glass creations, marked by strange, venous bulbs, eerie tendrils, and massive towers of color, all wrought together in a psychedelic weave of texture and (frequently) enormous scale. If Peter Max blew glass instead of spewing paint, he’d be Dale Chihuly. Like Max, Chihuly has benefited greatly from the ever-hot debate over the permanence or value of his work. And if you don’t like it, he, in the words of Liberace, cries all the way to the bank. Doubling up on color by combining intense Arizona sunset light with some help from a polarized filter. 1/125 sec., f/5.6, ISO 100, 18mm. For the botanical denizens of the non-profit universe, however, the Chihuly phenomenon does have one indisputable trait: it puts butts in the seats. Gardens the world over record insane increases in attendance far beyond their normal “fan base” when Dale’s gorgon-like creations hit town and go mano-a-mano with their daisies and daffodils. For photographers, the juxtaposition of the organic and the “alt-ganic” is irresistible, and, here in the southwest, where sun is all, the extreme effects of our desert light give Chihuly’s glassworks a supernatural quality. 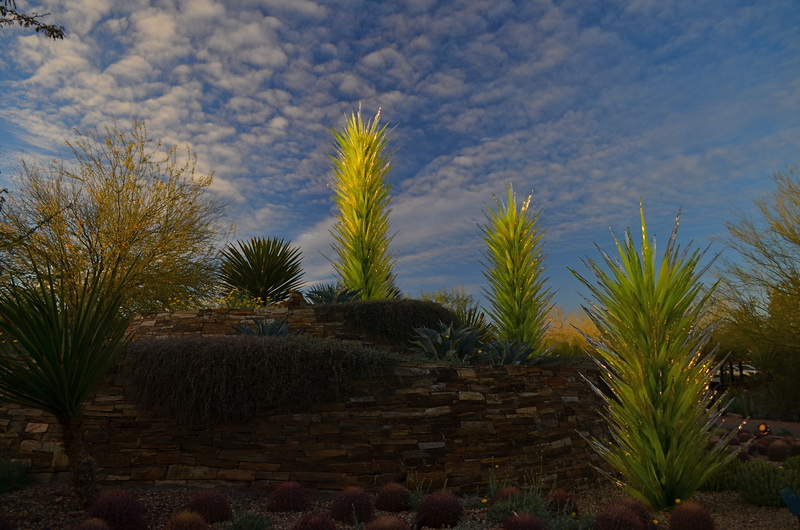 The Arizona “golden hour” just before final sunset produces very deep and intense color, and the Chihuly works installed at Phoenix’ Desert Botanical Garden catch it like neon prisms. Go a little further and add, say, a polarizing filter to this natural amplification of color, and the hues go into overdrive. It’s Golden Hour on steroids. The three glass “bushes” in the above frame, installed permanently at the DBG’s guest arrival area, are high enough above average terrain to act as light blotters for the late afternoon light. The addition of the polarizing filter seems to double the effect, although it will deepen and darken shadows in other parts of the images, and so exposure choices become a mite trickier. In this case, the striated clouds overhead also benefited from the tweak as they stood in sharper contrast against the sky, but, full disclosure, that part was dumb luck. But hey, even dumb luck can make you a little smarter. And buy you a bigger chunk of “luck” next time. Does Dale do it for me as an artist? Does it even matter? His stuff creates light opportunities, and you can serve me up a plate of that anytime. 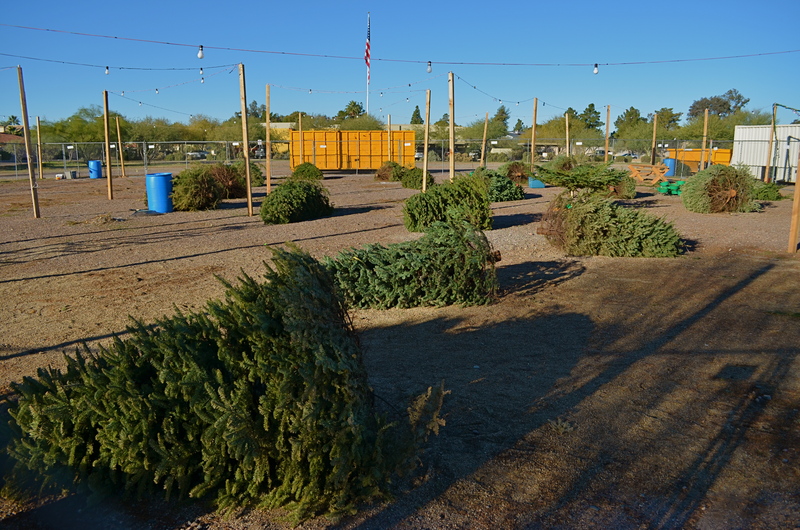 The Leavings: Christmas Tree Lot, Phoenix, AZ, 12/26/13. 1/500 sec., f/5.6, ISO 100, 18mm. PHOTOGRAPHY IS THE SCIENCE OF SECONDS. The seconds when the light plays past you. The seconds when the joy explodes. The seconds when maybe the building explodes, or the plane crashes. The micro moments of emotion’s arrivals and departures. Here it comes. There it goes. Click. We are very good with the comings….the beginnings of babies, the opening of a rose, the blooming of a surprised smile. However, as chroniclers of effect, we often forget to also document the goings of life. The ends of things. 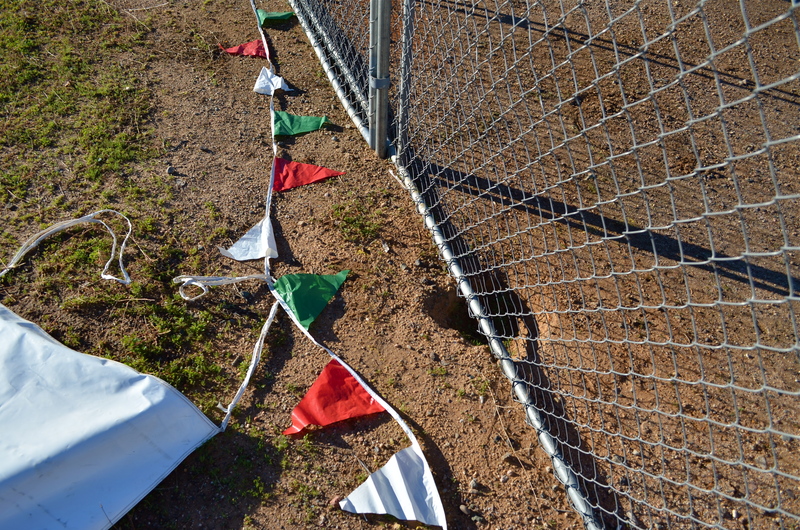 The moment when the party’s over. Christmas is a time of supreme comings and goings, and we have more than a month of ramp-up time each year during which we snap away at what is on the way. The gatherings and the gifts. The approaching joy. But a holiday this big leaves echoes and vacuums when it goes away, and those goings are photo opportunities as well. This year, on 12/26, the predictably melancholy “morning after” found me driving around completely without pattern or design, looking for something of the magic day that had departed. I spun past the abandoned ruin of one of those temporary Christmas tree lots that sprout in the crevices of every city like gypsy camps for about three weeks out of the year, and something about all its emptiness said picture to me, so I got out and started bargaining with a makeshift cyclone fence for a view of the poles, lights and unloved fir branches left behind. Pack up and get out of town. The earliness of the hour meant that the light was a little warmer and kinder than would be the case later on in the bleached-out white of an Arizona midday, so the scene was about as nice as it was going to get. But what I was really after was the energy that goes out of things the day the circus drives out of town. The holidays are ripe with that feeling of loss, and, to me, it’s at least as interesting as recording the joy. Without a little tragedy you don’t appreciate triumph, and all that. Christmas trees are just such an obvious measure of that flow: one day you’re selling magic by the foot, the next day you’re packing up trash and trailer and making your exit. Photographs come when they come, and, unlike us, they aren’t particular about what their message is. They just present chances to see. Precious chances, as it turns out. 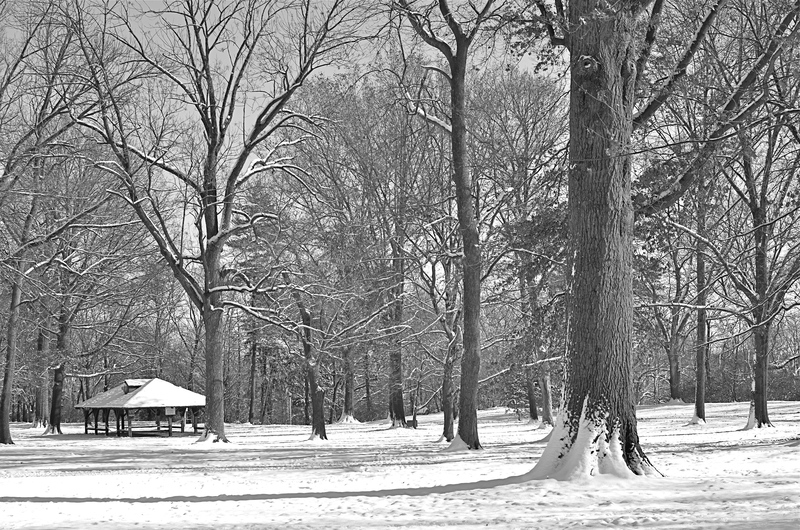 A decent winter scene, a bit too charming in its full color original, converted in-camera to straight monochrome. Now, however, it’s too bland. ONE OF THE GREAT BENEFITS OF DIGITAL PHOTOGRAPHY, other than its ease and affordability, is the speed at which it allows you to make comparative value judgements on images in the field. Even as digital darkrooms make it ever easier to change or modify your vision after the fact, today’s cameras also allow you to choose between several versions of a photograph while its subject is right at hand. This is an amazing mental and artistic economy, and it’s another reason why this is the absolute best time in history to be making pictures. Many of us who made the transition from film have a lifelong habit of “bracketing”, taking multiples of the same image over a range of exposure rates to ensure that we are “covered” with at least one keeper in the batch. Others have already adopted the equivalent habit of taking several different frames with a sampling of varying white balances. I also find it helpful to use today’s in-camera filters to instantly convert color shots to three other monochrome “takes”….straight black and white, sepia and cyanotype. It’s a way to see if certain low-color subject matter will actually benefit from being reworked as duotone, and knowing that fact extra fast. Another in-camera conversion, this time to cyanotype. This one says “winter” to me. 1/320 sec, f/5.6, ISO 100, 35mm. Color or its selective elimination is one of the easiest tools to wield in photography. In the case of the series shown in this post, I decided that the winter scene was a little too warm and cheery in full color, a little flat in straight B&W, but properly evocative of winter’s severity in cyan. The choice was quick, and I still had the color master shot that I could choose to massage later on. Shooting fast, that is, at the speed of your mood or whim, is a remarkable luxury, and exploiting it to the max is easy with even the most elementary camera. And anything that converts more “maybe” shots to “yes” is my idea of a good time. I’ll have a Blue Christmas, thank you. All The Trimmings, 2013. 1/160 sec., f/5.6, ISO 100, 35mm. IF YOU HAVE BEEN ON THE PLANET FOR MORE THAN FIFTY CHRISTMASES, your holiday memories (at least those frozen in family snapshots) will include more than a few black and white images. Some families made the switch to color photography earlier than others, but, at least until the mid-1960’s, for millions of us, more than a few “our best tree ever” photos were shot in monochrome. A little web research or family album-browsing can illustrate just how well beloved memories were captured by millions of us, long before Kodachrome became the visual currency of family folklore. It’s interesting to note that, with the universal availability of not only simple cameras but post-processing apps, there’s been a sort of retro-fed love of b&w that’s refreshing, given that we are, once again, admitting that some subjects can be wonderfully rendered in a series of greyscale tones. Certainly the general marketing and depiction of the season is a color-drenched one, but many new photographers are re-discovering the art of doing more with less, or, more properly, seeing black and white as an interpretation of reality rather, as in the case of color, as a recording of it. Observing the season out in the American West, thousands of miles from loved ones, I find that my holiday shots are increasingly journalistic or “street” in nature, since I am viewing and interpreting other people’s Christmases. 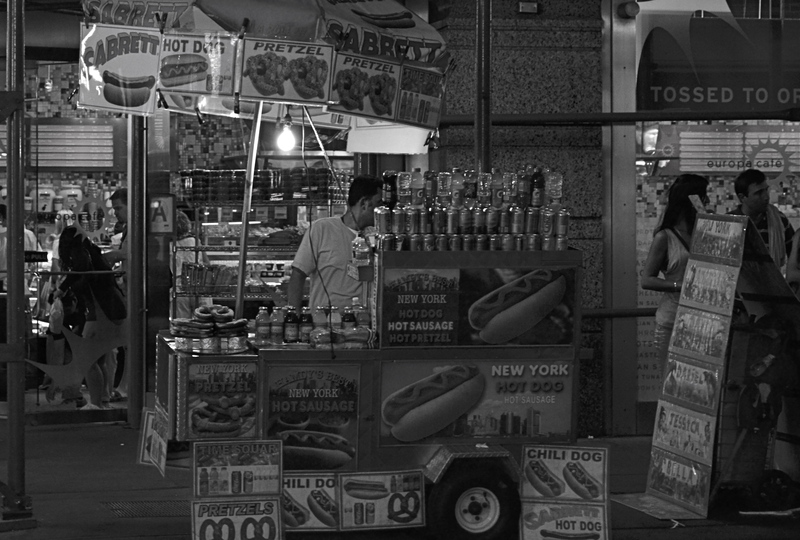 The contours and designs of retail become a vibrant source of stories for me, and black and white allows me to shoot at an emotionally safe distance while calling special attention to texture and detail. 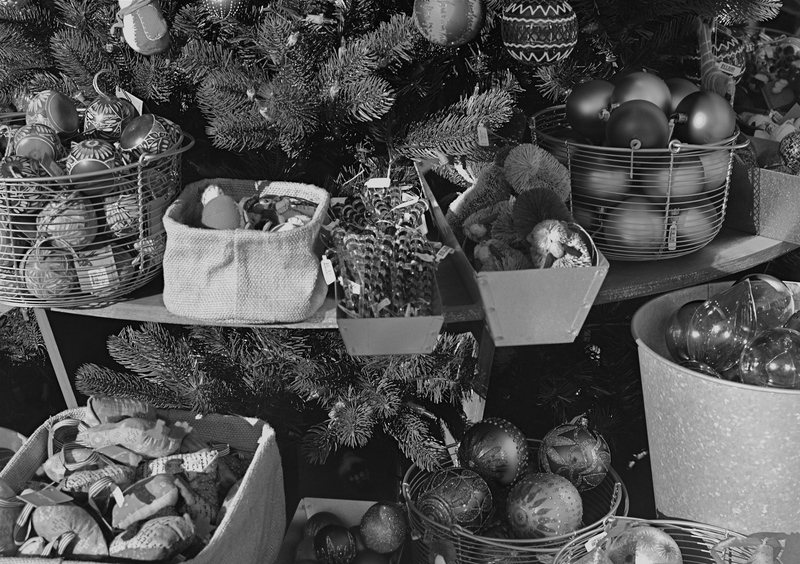 Depending on whether you’re showing the splendor of food and presents or evoking some Dickens-era urban grit, some subjects will come up flat or drab in black and white, given our very specific memory cues as to what Christmas should “look like”, so getting the desired result may be elusive. But, of course, if photography was easy, everyone would do it. Oh, wait, everybody does do it. Thing is, you always add another voice to the creative conversation. That’s the best part of both photography and the holidays. No way is best but your way. Abiquiu, New Mexico, October 8, 2013. 1/400 sec., f/5.6, ISO 100, 30mm. IT’S NOT HARD TO RETURN FROM A SHOOT WITH FAR LESS THAN YOU HOPED FOR, BECAUSE IT HAPPENS SO MUCH OF THE TIME. Coming home with a sack full of visual Christmas that you hadn’t even thought to ask for is far more rare. With that in mind, I have just opened an entire tree-ful of treasures upon flying back from my first visit to New Mexico in three years. 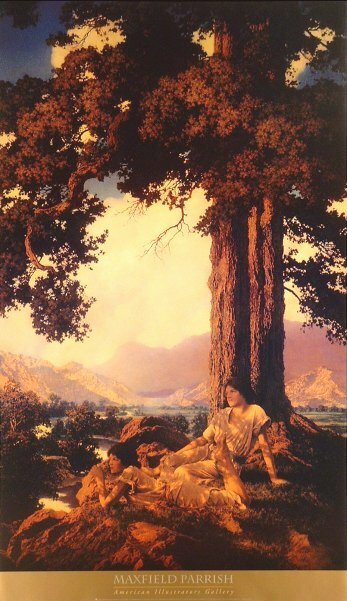 Maybe that should be trees full, given the golden glow of the entire state under a wash of autumnal cottonwoods during my time there. As covered in the previous post, Redemption, One Frame At A Time , I was returning to NM for personal reasons, but also to tackle the problem of color “softness” that blunted the impact of some of my shots from previous trips. The blistering brilliance of sunlight in the southwestern states is unlike anything photographers will face within the USA, and what looks like “blue” sky to your naked eye will often register as pale blue or even white once the shutter snaps. Here in Phoenix, Arizona, I’ve learned to make a few basic exposure adjustments to compensate over the years, but recently I have also begun to attach a polarizing filter to cut the way-crazy glare of midday, and I was eager to see what could be accomplished in New Mex, where my destination would be another 4,700 feet above sea level higher, and even more blinding in its intensity. 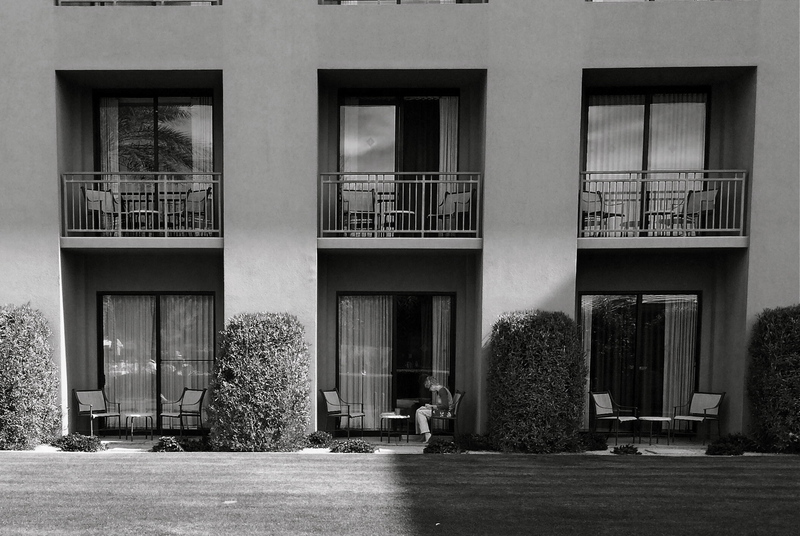 October 29, 2013, Albuquerque, New Mexico. 1/800 sec., f/5.6, ISO 100, 35mm. 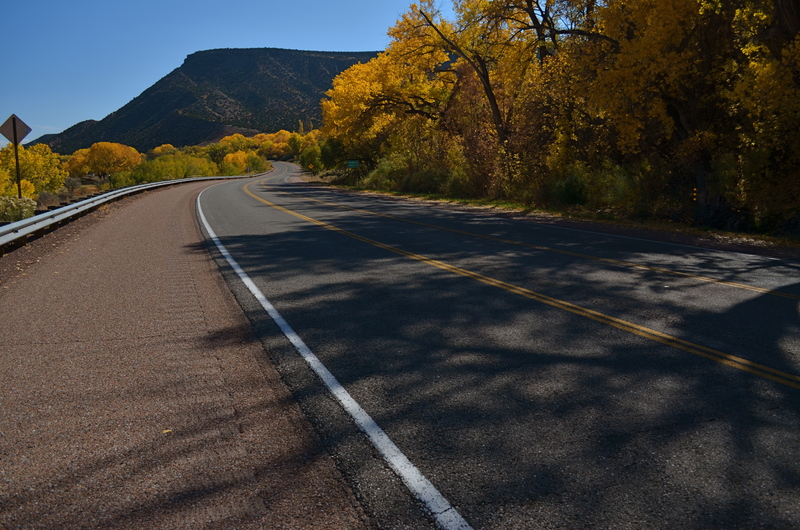 Once I got to the tiny town of Abiquiu, the historic landing point of painter Georgia O’Keeffe, I realized that, along with rendering the skies the correct blue, the filter was also going to produce an intense yellow as contrast, since the area’s native cottonwoods were exploding with gold, softening the harsher terrain and popping against the sky with a near-neon vibrancy. Having lived in the southwest for nearly fifteen years, I had long ago learned to live without the full range of hues that were a given, in states where the seasons are visually more defined. It was like coming home. Golden leaves, earth tones, weathered wood, sand and stone all combined to deliver a textbook autumn for my grateful eyes, and I proceeded to hammer the shutter button until my arthritis threatened to end the party. Reaping an unexpected harvest is the best part of photography. It’s the perpetual thrill of hearing light saying: See what happens when I do……this. Verdant, 2013. 1/60 sec., f/5.6, ISO 500, 35mm. PHOTOGRAPHIC STILL-LIFES ARE THE POOR MAN’S PRACTICE LAB. All the necessary elements for self-taught imaging are plentiful, nearby, and generally cheap. As has been demonstrated perpetually across the history of photography, the subjects themselves are only of secondary importance. What’s being practiced are the twin arts of exposure and composition, so it doesn’t matter a pig whistle whether you’re assembling a basket of oranges or throwing together a pile of old broken Barbie dolls. It’s not about depicting a thing so much as it is about finding new ways to see a thing. That’s why an entire class of shooters can cluster around the same randomly chosen subject and produce vastly different viewing experiences. 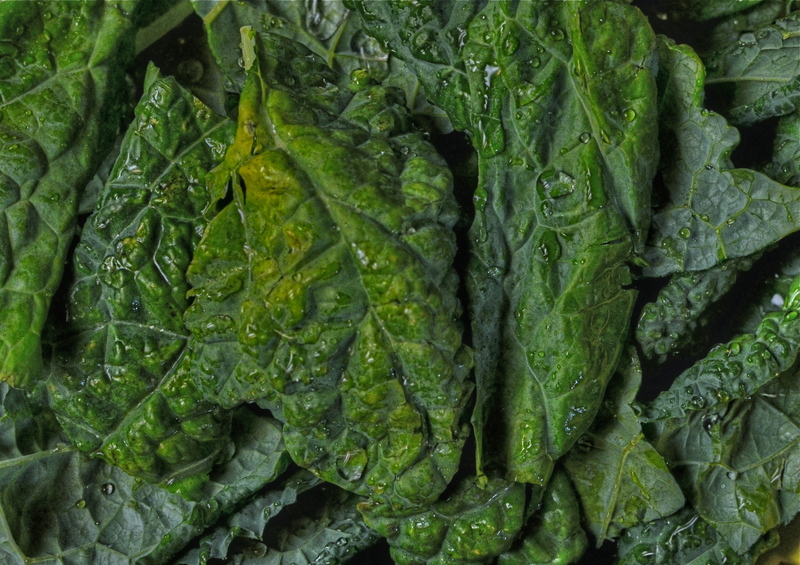 And why one of the most commonly “seen” things in our world, for example, food, can become so intriguingly alien when subjected to the photographer’s eye. Shooting food for still-life purposes provides remarkably different results from the professional shots taken to illustrate articles and cookbooks. “Recipe” shots are really a way of documenting what your cooking result should resemble. But other still-life shots with food quickly become a quest to show something as no one else has ever shown it. It’s not a record of a cabbage; it’s a record of what you thought about a cabbage on a given day. 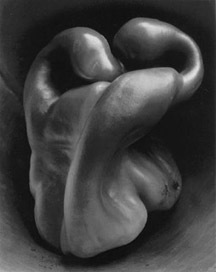 Edward Weston, Pepper # 30 (1930). Many books over the years have re-printed Edward Weston’s famous black-and-white shots of peppers, in which some people “saw” things ranging from mountain terrain to abstract nudes. These remarkable shots are famous not for what they show, but for what they make it possible to see. Food’s various signature textures, under the photographer’s hand, suggest an infinite number of mental associations, once you visually unchain the source materials from the most common perception of their features. As the head chef around my house, I often pick certain cooking days where I will factor in extra time, beyond what it takes to actually prepare whatever meal I’m planning. That additional time is reserved so I can throw food elements that interest me into patterns…..on plates, towels, counters, whatever, in an effort to answer the eternal photog question, is this anything? If it is, I snap it. If it’s not, I eat it (destroying the evidence, as it were). Either way, I get what I call “seeing practice”, and, someday, when a rutabaga starts to look like a ballerina, I might be ready. Or maybe I should just lie down until the feeling passes. ONE OF THE MOST MIRACULOUS FEATS OF PHOTOGRAPHY, TO ITS ORIGINAL 19TH-CENTURY AFFICIONADOS, was to freeze time, to arrest or isolate the continuum of progress. Indeed, if you think about it, the act of snatching a fragment of life, of holding it immobile for endless examination, is truly amazing, even at this late date in the art’s development. We spend a huge part of the time that is trying to grab a souvenir of what’s about to become was. 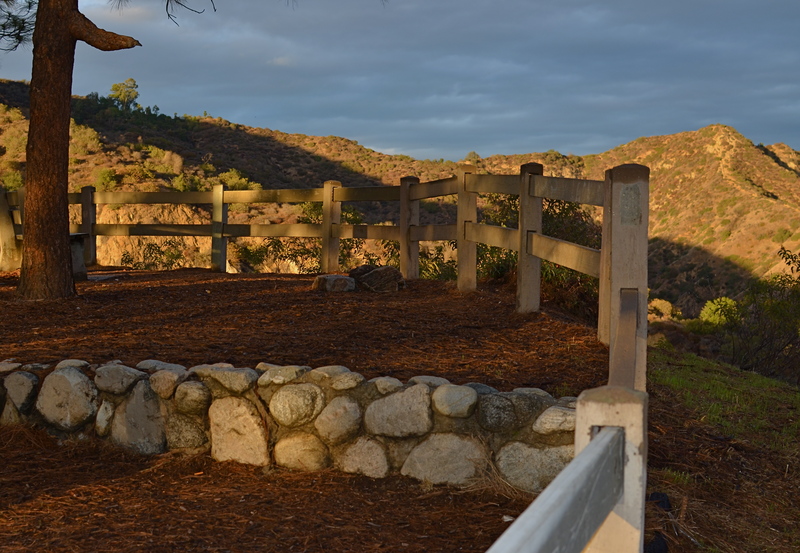 Photography’s great gift, being able to document time’s passing….its ravages, its wear and tear on the things of this life is often focused on the living world; people, trees, the temporary aftermath of a rainstorm, the quick passing of a sunset. But it can be an intriguing way to measure the impact of time on inanimate thing as well. Slicing, dicing, magnifying, and parsing time as we do with cameras, we can concoct an infinite number of ways to pore over the details of things that, in previous ages, only the poets fixated upon. The world has become our microscope lab, a petri dish for experiments in seeing and analyzing. “A rose is a rose”. 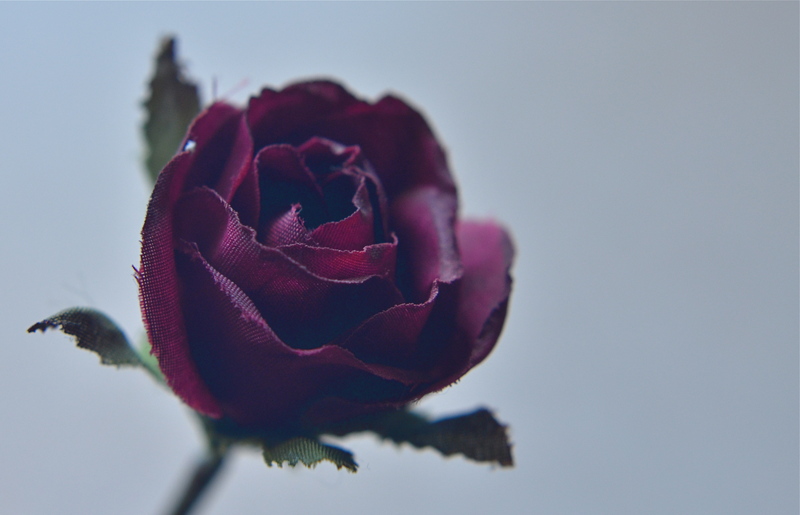 Unless it’s a ragged, fake rose. 1/50 sec., f/4.5, ISO 640, 35mm. What started this whole train of thought was the recent discovery, under a bed, of an old fabric rose. Sadly, I have long since passed the point where I can actually throw anything away without having some kind of debate inside my skull about whether it’s worth looking at, one more time, before a lens. In this case, I was intrigued by how frayed and threadbare the thing had become over time, its petals and leaves bereft of any ability to create even the illusion of beauty. Its magic, and thus its reason to exist, had vanished. Even if such little exercises don’t result in great pictures, they do result in a speedup of the learning curve, and as practice, as seeing everything in as many ways as possible. Not a big lesson. Just a lot of little ones bunched together. I will never know the name of the stock photographer at Columbia Records who shaped me with this image. But I know his genius. ONE OF THE TRICKIER PARTS OF BEING MY AGE is that I have been carrying around certain creative influences inside my skull for so many consecutive decades that their origins often blur. Who said it? Where did I brush up against that angle, that idea? Where did I see it? Book? Movie? Conversation? Who brought me into contact with this treasure? Inspiring mentor? Loving teacher? Teaching lover? Of course, it can be argued that what you walked through the door to discover matters more than the door itself. Maybe. But for me, the door and the room it leads to are two halves of one whole. For most of my life, I have been fascinated by the intentional “un-realing” of color, the hypnotic spell of hues that weren’t “that way in nature”, but, through interpretation, could add drama and impact, even magic to the final version of an image. About a week ago, I was reminded of one important reason why I feel that way. 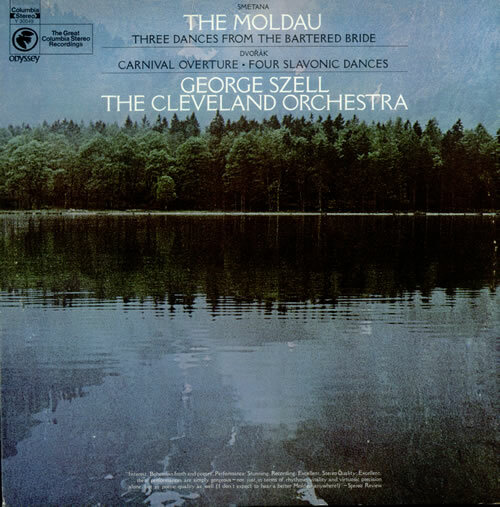 Researching composer Bedrich Smetana’s gorgeous musical love poem to his homeland, The Moldau, I set eyes on an image that I had not seen for over forty years; the cover photograph for a recording of Moldau by George Szell and the Cleveland Orchestra that I purchased in the 1970’s. My own copy of the original LP is long gone, but I still own a reissue of the performance, music that afforded my teenage self a serenity, a dream quality, a magic that travels within me to this day. In true “multi-media” fashion, I never listened to the original album without its cover within clear sight, its blue-green image of a soft-focus lake and forest quieting my nerves, inducing the music’s spell again and again. One one level I knew that the colors in the photograph were not “natural” in the strictest sense, but they were nonetheless hypnotic. Through them, I saw Smetana’s homeland, its villagers, its folks rituals, and the beautiful river Vlatava. For me, the picture was the music, and the music was the picture. Energy flowed seamlessly from one conception of beauty to the other. 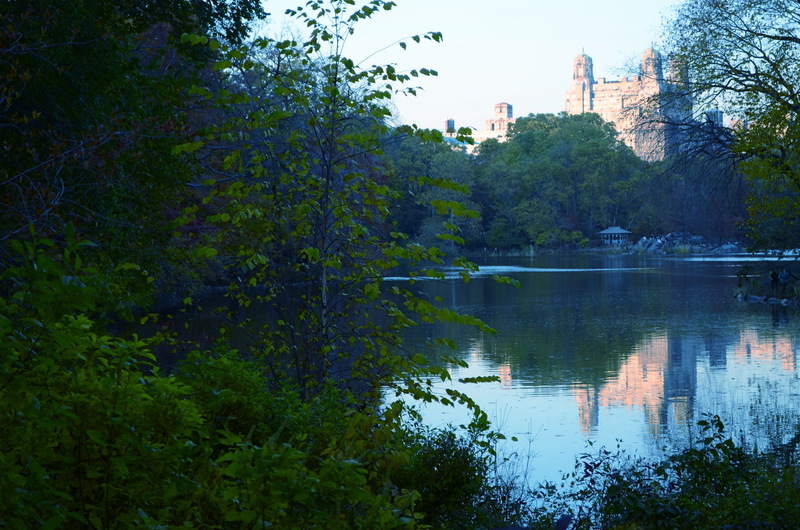 The Lake, Central Park West, NYC., 2011. 1/80 sec., f/5.6, ISO 160, 50mm. Some of my own work, naturally, strives for this quality, the ability of a photograph to unchain the mind, to allow feelings to flow, to allow color to be abstracted, just like language or music. Some will call it influence, others imitation. I prefer to think of it as respect. And while I will never know the name of the stock photographer whose image was probably slapped onto The Moldau’s album cover as a clerical afterthought, I love it when I see his work leak through my fingers, if only a little. Shade your dreams however you like. And let the music surrender its colors.